This intensive 6-day course offers candidates a fantastic opportunity to gain an ITEC accredited Level 3 Diploma in Sports Massage. This qualification is widely recognised and will enable individuals to practise independently as a Sports Massage Therapist. It is widely recognised as a robust and very well respected qualification which arms candidates with the necessary skills to work in a professional sporting arena or in private practice from the moment they qualify. 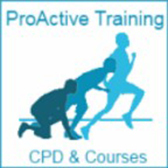 Individuals who have qualified through ProActive Training have gone on to pursue careers on a sporting platform including positions with Arsenal FC, Charlton Athletic FC, Aston Villa FC, Middlesbrough FC, USA Track and Field, Middlesbrough FC, Wimbledon Lawn Tennis Association, London Triathlon, Harlequins RFC and many more. The qualification also enables students to work in private practice as a Sports Massage Therapist with up to £1million insurance and many of our students have gone on to start their own practice and have grown very successful businesses. The course will enable students to work in private practice as a Sports Massage Therapist for up to £1 million of insurance from the moment they qualify. The qualification is internationally recognised allowing students the freedom to work in countries across the globe. All our courses are taught by practising Physiotherapists or Osteopaths who are also qualified Sports Massage Therapists with years of industry experience. This level of tuition and expertise is unmatched by other training providers and our 98% first-time pass rate is testament to this high calibre of teaching. The courses is taught through classroom delivery and practical demonstrations. You'll practice on fellow course participants and complete home study and work packs, a work log, a practical assessment and one written assessment paper. Undergraduate and Postgraduate Physiotherapists, Osteopaths, Chiropractors, Sport Scientists, Strength and Conditioning Coaches and qualified Fitness Professionals are all eligible to apply. You will need a friendly mature attitude, good communication skills and take pride in your personal appearance. You must be 100% committed to the course duration. Please apply directly through the ProActive Training. The course cost is £550.